Tom Foley is listening. Cathy Osten is talking. And the press are recording. 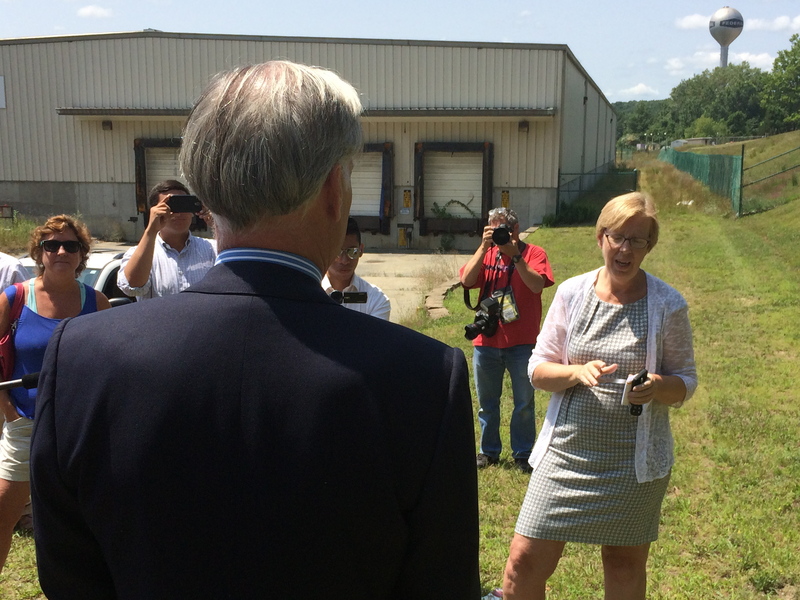 Sprague – Near the gate of a doomed paper mill, Republican Tom Foley alighted from the back seat of a blue BMW sedan Tuesday to assail the economic policies of Gov. Dannel P. Malloy, only to find himself in a raucous street debate with the local first selectwoman and soon-to-be jobless workers. That incensed Mike D’Auria, a Fusion manager who is trying to assemble a group that can buy a portion of the mill. It was hardly the exchange planned by Foley, a Greenwich investor whose previous run for governor was hampered by allegations during the 2010 Republican primary and general election that he had bled cash from a failing Georgia textile manufacturer, the Bibb Co.
As Foley argued with Osten and several workers, the scene was recorded by reporters and staff members of the campaigns of John P. McKinney, who is competing with Foley for the GOP nomination, and Malloy, the first-term Democratic incumbent. Mark Bergman, the spokesman for the Malloy campaign, had come to defend the governor. But when the news conference finally ended, Bergman just smiled, shook his head and told reporters he had nothing to add. Democrats later posted an unedited video of the entire event on YouTube. Osten and the workers had drawn the parallels to the Bibb Co. that Bergman was prepared to make with a six-page paper about Foley’s management of the textile company. Foley and Osten faced each other outside a factory. Fusion is owned by OpenGate Capital, a private investment firm with offices in New York, Los Angeles and Paris. The Bibb was owned by NTC, an investment firm Foley founded in 1985 after leaving Citi Group. Bibb eventually was forced into bankruptcy, and Foley left as chief executive. It later closed. “You’re a businessman,” said Rich Harrelle, a 29-year employee of the mill and president of United Steel Workers Local 1840, which represents the Fusion employees. “You close mills down,” Harrelle said. Foley interrupted to correct himself and Harrelle. “I have never closed a mill down, sir. I didn’t close the Bibb mill. A subsequent owner closed it. So, please get your facts right,” Foley said. Foley remained composed, even as the exchanges grew sharper. He stood, hands folded in front of him, his blue suit jacket buttoned, throughout the event. Foley and Mike D’Auria, a company manager who says the cause of Fusion’s demise was market forces, not politics. Standing in front of a Fusion sign, Foley insisted that the mill was closing due to a poor business environment that he says is the result of Malloy’s first-year tax increase of $1.5 billion and other anti-business policy decisions. Foley did not answer directly when asked if a Foley administration would have extended Fusion economic assistance, as did the Malloy administration. The state gave the company a $2 million loan in September 2013, which was partly forgivable if employment increased the mill remained open for 10 years. The state was prepared to offer another $1 million in assistance. Andrew Doba, a spokesman for the administration, said the company now must repay the loan and pay a financial penalty of 7.5 percent on the outstanding balance of $1.8 million. “Listen some incentives and some credit support programs work,” Foley said, without saying if he would have approved a similar loan. At that point, four minutes into what turned out to be a 30-minute press conference, Osten interrupted. “Are you a member of the press?” he asked. “I am the first selectman,” she replied. “OK, you’re not interviewing me. Are there any questions from the press?” Foley asked. But she persisted, and Foley soon was drawn into a debate with Osten, then with several Fusion employees. 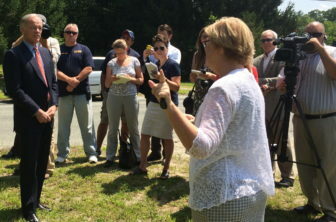 “This may be your press conference, but eastern Connecticut is extremely important to me,” Osten said. “OK, well, fine,” Foley said. “We have all worked hard here,” Osten told Foley. Osten told him the company is closing because OpenGate is selling assets to a competitor, similar to the practices she says helped lead to the demise of the Bibb Co. Foley’s replies then grew sharper, and he started to focus on Osten. “You have failed at your effort to keep jobs here, haven’t you? You’ve failed. And Gov. Malloy has failed along with you. And you’ve wasted taxpayer money,” Foley said. Osten said the state is collecting its debt. She told Foley he has offered no indication how he would have kept Fusion open. At times, she and Foley spoke over each other. Harrelle said the union signed a six-year contract in March, accepting a two-year wage freeze. With the new contract and the state’s assistance, Harrelle said he thought Fusion had stabilized. Foley told Osten and the workers they did not understand business. To Osten, he said if OpenGate has sold off assets, it was out of necessity. In response to a reporter’s question — the press managed to ask a few questions — Foley said he was unaware of any company that would sell off assets of a profitable company to cash in on an investment. D’Auria told him market forces were responsible, not Malloy. Fusion specializes in food packaging, and the industry is using more plastic and less paperboard. OpenGate, whose other extensive holdings include TV Guide, did not respond to a request for comment on what led the company to sell its paperboard manufacturing machine, which the union says was one of only two in the world. On its web site, OpenGate says its “investment strategy is focused on lower-middle market, cross-border, corporate divestitures and carve-outs” and that one characteristic of its acquisitions is a “motivated seller.” It purchased Fusion in 2011 from Cascade, a publicly traded Canadian company. At the time, the company says it saw opportunities for growth in the paper boxboard business. 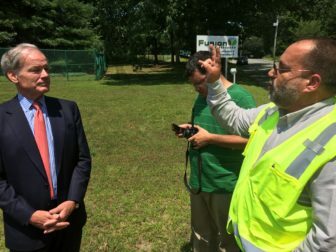 Foley was asked by a reporter if every business failure was a failure of the Malloy administration. He said it was not. Some industries “mature” and no longer can compete, such as textiles. Foley acknowledged he had done no close analysis of Fusion, other than reading what had been published in the press.